These are Non-Regular Inventory shirts - most are overcounts from custom orders. 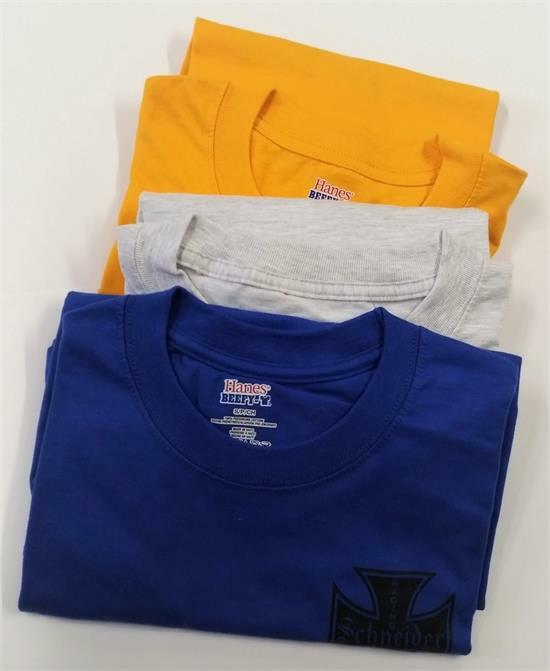 They are still the same 100% cotton t-shirts we use for our black and white shirts, but in different colors. In all these shirts, the silkscreening is in black. The "Classic Design" features a small logo over the heart, and a large logo on the back. The "Orginal Desing" features a large logo centered on the front and back. These are limited to whatever stock is on hand. If you want to do a custom order of a style or color, they come in quantities of 6, or 12. Please call for details. Thank you.